When the ads started to showing up in the mail back in the fall for ConExpo/ConAgg 2014 in Las Vegas, my first thought was “I’ll drive to Las Vegas before I fly US Airways.” Given the first and last time I flew with them was to the same convention in Las Vegas not 3 years before, the horrendous trip was still fresh in my mind. When I started shopping in January my plan was to fly Delta from Bangor and in a round about way hit Atlanta to fly on a newly reconfigured B757-200 with the lay flat seats on the way. The return was to be more direct but was unable to get a red eye back on the day that I needed. With Delta being out my options were US Airways out of Bangor and then Jet Blue/Southwest from Portland. So naturally my focus went to Southwest/JetBlue, because I wasn’t going to drive my Chevy to Vegas. Immediately Southwest was out due to price and schedule. I’ve always flown Delta, from the days of the L-1011 and 727 and never had a complaint. Well, except for the 3rd world country otherwise known as LaGuardia. This time I stepped out of my airline comfort zone and into the wild unknown. Ok, it really isn’t wild, nor is it unknown. About the only unknown was JFK. Starting off with the booking process, it was a breeze. Of the 4 airlines I checked, (AWE was horrendous, thus reminding me why I don’t fly them) the JetBlue website doesn’t even have close competition. Southwest was decent but I’m convinced my mother would have no issues navigating it. And that’s saying a lot. Entering trip info is a breeze, search results display quickly and unlike Delta you can see both departure and return flights all on one screen. Seat selection is fairly straight forward, pretty much on par with other airlines. The flight extras are easier to navigate as well as options you can purchase on the flight such as various lunch boxes or a pillow and a blanket that nobody else has used(you know since everything else on a germ tube, I mean aircraft is clean). After booking the flight I downloaded the JetBlue app to my phone and signed in. The app is as user friendly as the website is. From there you can log in and view your trips and check in, book flights, check status of your flight and check out the in flight offerings from DirecTV, SiriusXM, to movies and snacks. The trip to Las Vegas was scheduled to leave March 3rd around 3pm and return on the 7th at 10pm. As has been the case this winter, seemingly every 3 or 4 days, a major storm was rolling across the Midwest heading for NYC. In preparation for what would turn out to be merely a dusting, the original flight was cancelled. I found out on Friday afternoon from an alert on the app. I went online to see what I could do and was able what I thought at the time, would be to leave Portland earlier, beat the storm and get out on an earlier flight. Well sign me up, this is easy as pie! Off I went to a hockey game and on the second intermission as I’m enjoying a super pretzel and a water, my phone starts going sending me alerts. In anticipation of Winter Storm Whatshisname (seriously, the Weather Channel needs to stop naming winter storms), your flight has been cancelled and we will re-book you. Fabulous. After leaving the game I tried to call JetBlue, like everyone else did, so after sitting on hold for a half hour, I gave up. After hanging up the phone starts blowing up again with alerts, just like that I was re-booked on the original flight from Portland and an earlier evening flight from JFK to Las Vegas. Score! Having checked in on the app, upon arrival in Portland, I went directly to the line and within 3 minutes I had checked my bag and was heading to security. I didn’t encounter a person on any leg of the trip that was anything less than happy to have me as a passenger on their airline. Be it the ticket counter agent, gate personnel or the flight crew, they were nothing short of amazing. Prior to pushing back from the gate the captain comes into the cabin to make announcements about the flight, thanking us for choosing JetBlue and wishing us a safe trip wherever your final destination may be. While this probably doesn’t seem like a big deal to some, small things like this help make people feel like a valued customer, instead of a number and set your brand apart from the others. On the shorter leg of my trip from Portland to JFK/JFK to Portland there was the usual pretzels/cookies/peanuts and beverage service. As always I opt for the cookies and water. You can’t beat miniature chocolate chip cookies. Unless you’re Delta and you’ve got Biscoff cookies. Paper may beat rock but miniature chocolate chip cookies NEVER beat Biscoff cookies. It’s just the way it is. For longer haul flights there are several options you can purchase for food. If you are trying to eat healthy there are several great options. All can be viewed from the app and purchased on the flight. From the varying Eat Up Boxes to sandwiches, salads, beef jerky and mixed nuts. Being somewhat of a health conscious person it is tough to eat in a relatively healthy way in an airport or on a plane. Not that I was going to get a lot of sleep on the flight, because honestly, my 6’3″ 260lb frame isn’t built for comfort on an airplane. 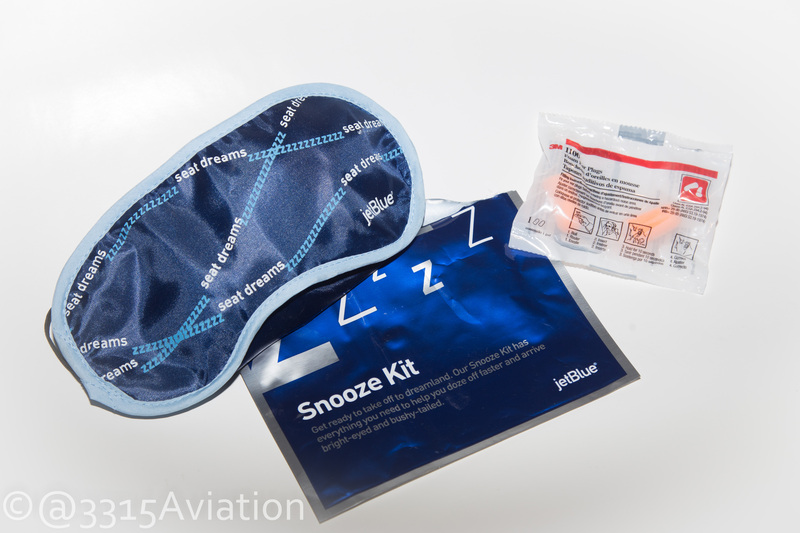 However, on red eye flights heading east with JetBlue, there are foil packs awaiting you with an eye shade and ear plugs in your seat. The Snooze Kit is complimentary and aside from the eye shade and ear plugs it includes a hot towel and orange juice or spring water. So if you’re not a 6’3″ 260lb powerlifter, you can catch a few winks in silence and darkness. Other airlines you can borrow one of their pillows and blankets for the flight. When your flight arrives at the gate, you just leave the pillow and blanket and they fold it neatly for use by the next person. Which they did when the person before you used it, and by used it, I mean sneezed, coughed or drooled on. You’re already stuck in a tube hurtling through the atmosphere full of germs, here have a slightly drooled on pillow. Not on JetBlue, you have the option to buy a Claritin pillow and an Arm and Hammer blanket for $5 that only you have used and can take with you for your next flight. As you sit down you notice the in flight entertainment(IFE) screen in the seat back in front of you. Plug in your earphones(or buy some if you left yours on the kitchen table) and enjoy a lineup of stations of SiriusXM Satellite Radio as well as 36 channels from DirecTV and JetBlue Feature movies. 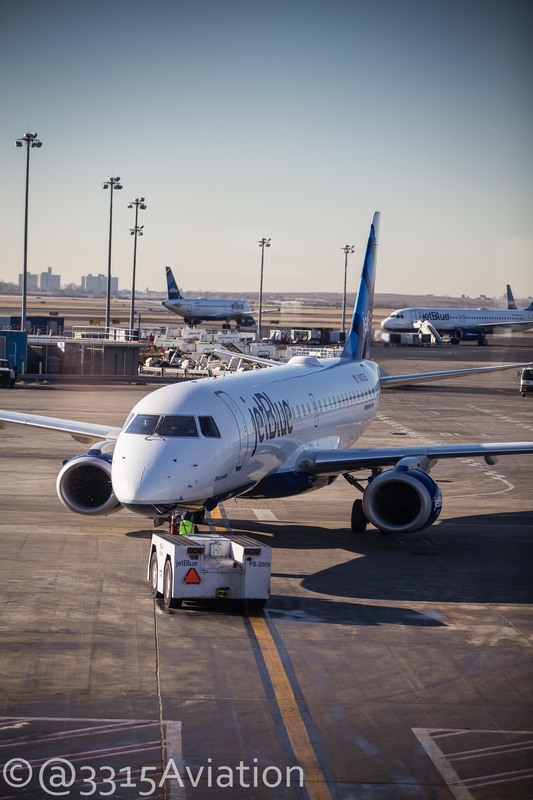 While I knew JetBlue had these features, I didn’t realize how much I would enjoy it until I flew with another airline who DIDN’T have IFE on their flights. While I travel with my iPod, I like the variety of music and sports talk radio selections. The one thing noticeable for me, even on the ERJ-190 flights, was the amount of legroom. JetBlue’s seat pitch ranks at the top of the industry. I was able to put my feet under the seat in front of me, even with the seat reclined my knees weren’t hitting. Talk about a savior on the flights to/from Las Vegas. My camera gear bag pulled under my legs allowed me to somewhat stretch out for the long flights. The seatbacks are higher than other airlines, allowing me to rest my head back and relax rather than doing head bobs for 4 hours. My experiences have been limited to 5 airlines but clearly JetBlue ranks at the top of the list. There is no question why they consistently receive high marks in customer satisfaction. My only negative mark against them is that they don’t offer service from Bangor. When I travel I like convenience, part of that is being 10 minutes from Bangor International. I’ve flown out of Portland a couple times and it is a great facility, but it’s also 2 hours away. When leaving on a trip, the drive down doesn’t bother me, it’s the parking for however long and driving home that does. At most I want to be pulling in the driveway at home a half hour after wheels down. It would appear as though there is a market, given the amount of Canadian traffic that travels from Bangor on Allegiant, Delta and US Airways. Let alone the people from Waterville and north to Fort Kent who travel through to Bangor or Portland to fly. The hub at JFK provides direct flights to just about anywhere you want to go in the United States, nonstop. With others you could be stopping at LGA, Philly, Detroit, DC, Baltimore or elsewhere. For the time being my allegiance will be with Delta, whom I have always had great experiences with and fly into Bangor. Should JetBlue start service from Bangor, I would forgo the Biscoff cookies and bleed blue. It might be a tough go at first, but I’m can adjust.